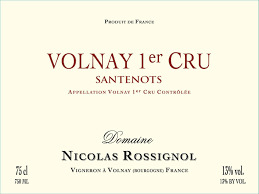 2015 Nicolas Rossignol Volnay 1er Santenots - $99.99: Vins Rare, The finest selection of rare wines. (13% natural alcohol; already racked into cuve): Very dark red with ruby tones. Liqueur-like black fruits on the nose, which shows a faintly tired quality. Then much fresher in the mouth but in a closed stage, conveying considerable power to the flavors of kirsch, blackberry and licorice. This rather massive Volnay, from deep, iron-rich soil, finishes with strong tannins and a faint animal quality. Rossignol works with two hectares, vinifying three different parcels and then assembling the wine. This wine is in an awkward phase now but I will give it the benefit of the doubt as it has not yet been sulfured.